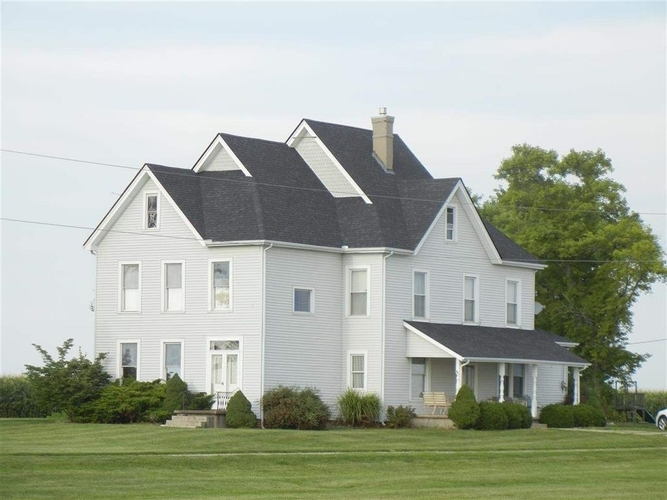 Impressive & distinctive is this home built in the Civil War era of 1860 located in southwest Tippecanoe Co, on 3.86 A. Formal entry foyer features an open stairway, authentic wide plank flooring & leads to all areas including the grand parlor with deep baseboard & wide woodwork trim. Unique den w/glassed door shelving, built in desk & adjacent to family room w/gas lot fireplace, dining room w/original plate rail & china cabinet. Updated kitchen w/island bar. Over 3500 sq ft of living space with 4 BR, 2.5 BA, on 2 levels plus a full floored attic. Zoned heat & AC, Enclosed back porch for mudroom & storage. Natures beauty surrounds this home with views of rich farmland, morning sunrises & breath taking sunsets. A rare find for you. 40' x 60' Pole Barn.